Dressed as gentleman, Demiurge is a floor guardian on the seventh floor of the Great Tomb of Nazarick and the Commander of the NPC Defenses. He was created by Ulbert Alain Odle. As a member of the Demon race, Demiurge is one of the cruelest members in Nazarick, taking great joy in the suffering of other races. He enthusiastically performs magic experiments on the prisoners sent to him, viewing them as nothing but toys, and enjoys inciting hateful feelings and treacherous thoughts among them. 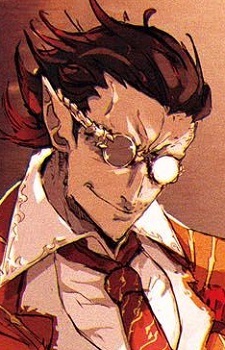 Demiurge works closely with the other servants of Nazarick and is loyal to the creators, thinking of them as important companions. However, due to their conflicting personalities, he and Sebas Tian do not appear to get along well.